So Tempeh is making another appearance during Vegan MoFo 2014. For those of you who do not know, Tofu and Tempeh have a bit of a friendly rivalry going on. Tempeh feels like he is living in the shadow of Tofu. Tofu gets a lot of the attention (both positive and negative) while Tempeh receives confused looks. Tofu Scrambles are all the rage on breakfast menus across the country but Tempeh Scrambles are a lesser known, homemade affair. 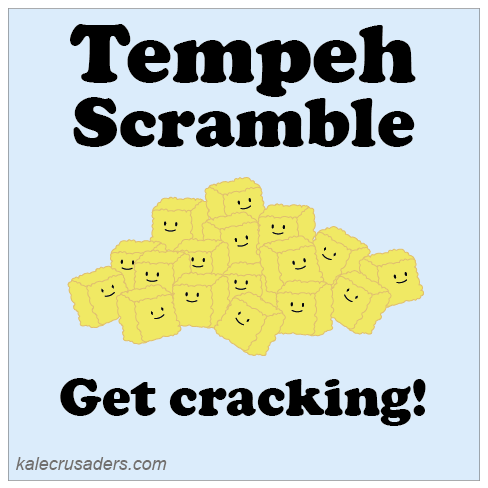 Help a Tempeh brother out and check out the Tempeh Scramble by Ty at Vegan Derby Cat Party.